At Rees Harps, all of us always have more than enough to do, but we also always seem to say “yes” to one thing – animal rescue work. Five members of our company are actively involved. Three (Joann, Melissa, and Garen) work with wild animals. Joann and Melissa are licensed to do wild animal rehabilitation and Garen is always there to support Melissa. I am active with the House Rabbit Society providing education, fostering and driving transport on the Bunderground Railroad. William patiently takes care of my bunny crew whenever I am away and sometimes that is not an easy thing…like the past few days. 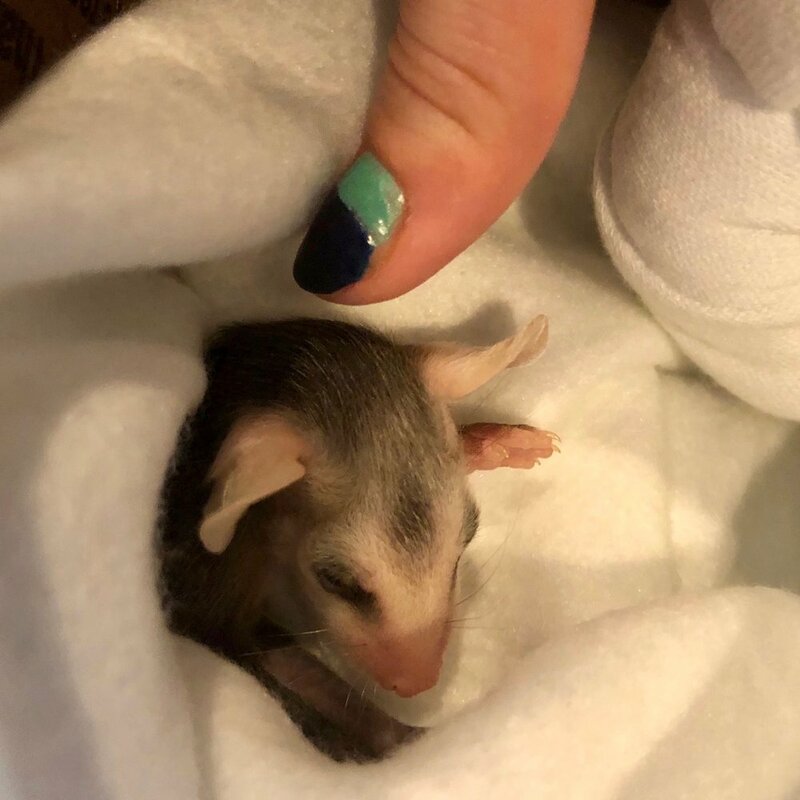 A baby opossum, next to Melissa’s thumb for scale. Melissa put together a beautiful video dedicated to the best opossum mom ever – Tilly. I strongly encourage you to watch it, but be aware that the first 17 seconds are bit graphic because they show the wounds Tilly received from having been shot prior to coming to Melissa, still alive, and with her eleven tiny babies. Did you know that more than 95% of opossums are immune to rabies and all of them are immune to lyme disease. They are not carriers. Opossums eat many pounds of ticks each year as well as all kinds of other things that are help to improve the planet and the environment for humans and for our pets. They are in no way aggressive. In other words, lots of opossums is a good thing. Currently, Melissa and Garen have a couple of sanctuary opossums, a handicapped snake, and a goose. They have to be ready for almost anything because animal control calls them with all kinds of animals in crisis. Thanks to Melissa and Garen, the sanctuary opossums will be released in the spring!! Their health cleared right up over the winter with lots of vitamins and a proper diet. We are so happy! Melissa learned how to do this from her mother, Joann, who also works for us. Joann has rescued many hundreds, if not thousands, of animals in her long career. If you drop by Rees you never really know what kind of animal may be there, resting quietly in its bed, while Melissa or Joann is attempting to nurse it back to health. Almost all of them make it and it is an incredible thing to watch or, more often, to hear about as they keep us updated on their latest arrivals. We are incredibly proud of them. The SPCA secures the bunnies in the van. For nearly three decades now, in my work with the House Rabbit Society (HRS), I have done many things. Most recently, I made a marathon trip for the Bunderground Railroad. In Texas, the Dallas SPCA was called in to pick-up 452 rabbits from a hoarding situation. Yes, you read that correctly, that is 452 rabbits! None of them were neutered or spayed and many of them were sick or, in some cases, injured. 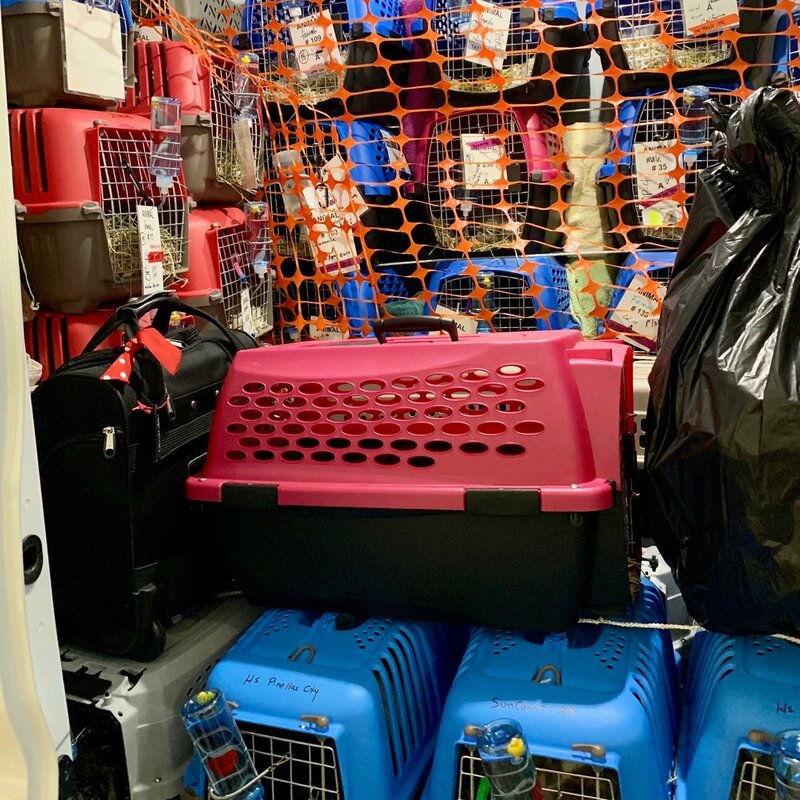 Dallas worked with local HRS affiliates to triage the bunnies, get them into a safe location with plenty of food and water and to get more than 100 of them spayed. Obviously, however, 452 was way too many for one metro area to absorb at a time so the bunnies needed to be distributed to other HRS chapters and affiliates around the country as quickly as possible so they could receive the veterinary care they needed and begin the path to their own Forever Homes. The folks in Dallas put out a plea for help and I volunteered to be part of a driving team. Last Thursday, March 21st, I flew to Atlanta and met the other driver on my team, Michelle. In a large cargo van we drove part of the way to Dallas on Thursday night and the rest on Friday. 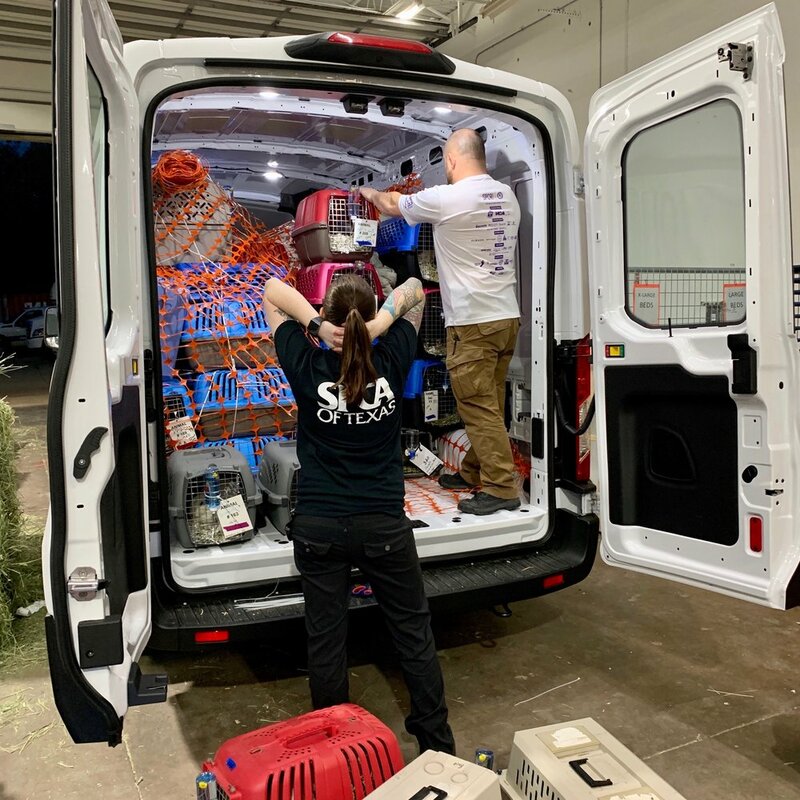 At 5AM on Saturday we drove to the Dallas SPCA where we were met by an incredible team of SPCA and rabbit rescue folks. They loaded-up our van with 68 carriers containing 86 rabbits and then Michelle and I drove for Atlanta. It was a 16 hour drive with stops for gas, (very) fast food and bunny checks. We reached the Atlanta SPCA and the welcoming, huge group of people from the Atlanta HRS chapter. Each one our 86 bunnies was checked, received any necessary veterinary care and at least 50cc of fluids. The Atlanta HRS and SPCA team stayed up all night with the bunnies. Bunnies secured and extra supplies, including an extra carrier, ready to go. Bright and early Sunday morning new driving teams arrived to take some of the bunnies north, toward the Washington DC area. Others, including Michelle, drove bunnies south to groups in Florida. All of this was coordinated by Lisa of the Bunderground Railroad, who manages to keep a million balls in the air at a time all the while making sure the bunnies get where they need to go just as quickly as possible. All this because some idiot had 452 rabbits. Each and every one of us is a part of the creation on this planet and we, as humans, have a special role. At Rees Harps we have chosen to extend our care and time and company resources in support of animals in need. This means that every so often one of us won’t be available because we are driving bunnies across five states or whisking an injured Canadian goose to the vet. We hope you understand.